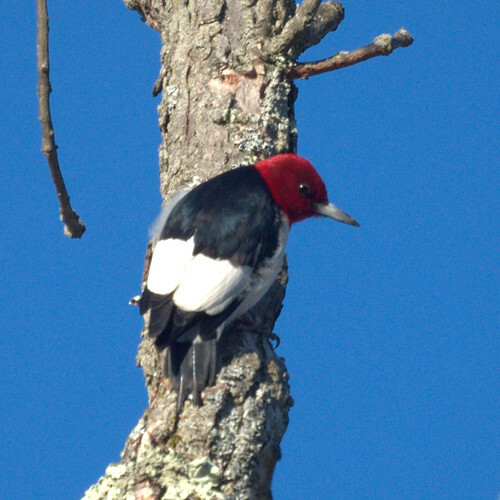 Red-headed WoodpeckerWe went to Glenhurst Meadows in Warren, NJ because some red-headed woodpeckers were reported there. After about 30 minutes, Chris spotted one and we enjoyed watching and photographing it. Nice shot Chris and Mike. Would you please give an idea where you saw the bird. I was at Glenhurst this afternoon and did not find the bird. Were you near the farm entrance? Is there a certain trail leading to the bird? Thanks for your help. This is a great location. It was our first time there. Beginner's luck? We used the info from previous reports. We parked near the community garden and silo. The bird was seen in the big trees to the left if you are looking out into the field. It spent a lot of time in the three front trees to the far left. We didn't find any trails, but we walked out a little from the lot until it got too wet.